This was very disappointing; It’s probably best to just get that out there at the start. Have no doubt, there is indeed a lot to like about Ciel Bleu; It has (in order of successfulness) an outstanding view over our beloved Amsterdam, good service, a fabulous sommelier, a thoughtfully laid-out (albeit bizarrely decorated) dining room, where you can actually hear your companions, and it has food; Pretty good food. But pretty good is not why we eat at this level of restaurant, and when you pay €160 for a meal, pretty good is simply not good enough. The restaurant has been in situ since the early noughties, perched on the 23rd floor of the Okura hotel where, almost a decade ago, it rose to the heady heights of a second Michelin star. Since then it had become known as the ‘most likely to win three’ amongst the local front-runners, but lately I have heard very little of it at all. It’s probably not unfair to say that it also has a reputation for being relatively safe, maybe perhaps as that was once a good strategy for reaching the pinnacle of Michelin. It’s like a vision of the future of restaurants, taken from an 1982 copy of Tatler. But the world has moved on, fine dining has been thoroughly transformed by guests almost universally rejecting the stuffiness and formality that has so long been associated with it. Even in Paris, modern 3 star restaurants are beginning to drop the dress code, and de-clutter the guests’ space of the gilded trinkets of a showier, more decadent past. 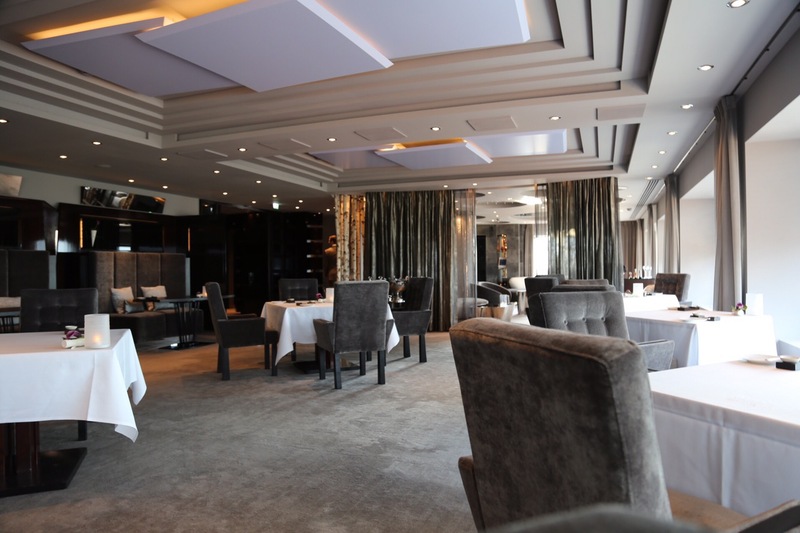 Last year the dining room at Ciel Bleu received a total makeover. Gone is the scribbly patterned floor and the champagne trolley of yore, and in its place something apparently designed by Kanye West. Deep shag pile carpet to cushion the impact of your date’s Stuart Weitzman heels, luxuriantly upholstered chairs, and ceilings resplendent with assorted shiny hangings I imagine stolen by magpies from the Venetian in Vegas. It’s like a vision of the future of restaurants, taken from an 1982 copy of Tatler. The amuses came out. Tiny crisps of artichoke flavoured with ras el hanout, black olive with feta, corn and lovage, delicious Amsterdam pickles and sausage of ox, plus a cone of shiitake and sea bream. These were touch-and-go. The little cone was lovely and bright, and the pickles and sausage was truly delicious; lots of acid to wake up the palate plus tonnes of rich, savoury, umami. The olive and feta however was both cloying and relatively tasteless, whilst the artichoke crisp was devoid of any flavour at all. Perhaps that’s why the tiny morsel was served on an entire boiled artichoke – to decadently remind you what you were actually eating. First up from the main menu things immediately began to look up as three courses of fish were placed quickly after another in front of me. The tuna was delicate and nicely balanced, albeit still nothing particularly remarkable, whilst the pretty signature dish of crab with caviar was fair but begged for texture. The sweet shellfish was encased in a gossamer-thin sheet which looked like nori but tasted deliciously otherwise, and, combined with a beurre blanc ice cream, it was perfectly nice to eat, but somehow slightly uninspiring. The third fish course of sea bass was by far my favourite of the triptych; The delicate raw preparation in a little Siu Mai wrapper was fresh and confidently simple, an excellent counterpoint to the warm main dish of faultlessly cooked bass in a lovely mussely sauce full of salty sea-side punch. This dish was delicious, but frankly also quite similar to any other fish, potato and cream sauce concoction available on any other decent bistro menu. I asked Nadya how she was getting on with the vegetarian menu. ‘I have the feeling that I can’t really remember what I just ate.’ A master of seeing the bright side even in the gloomiest outlook, she rarely says anything is bad even when it’s truly awful, so for her this kind of response was as damning an indictment as you are likely to get. And indeed the dishes on the vegetarian ‘menu’ were truly lackluster at best. The first course she described as some tomato arranged daintily in a bowl, whilst the tiny salad served in a side dish was just plain lazy. The secondary after thought dish of a crisp of seaweed was obscure in flavour and served dripping with oil. Far more successful was a well-rounded dish which cleverly paired celeriac with mole, but both the gnocchi dish and following beetroot was again all pretty colours and very limited punch. Poor Nadya had been waiting for dessert from the first dish. My meat course was a lot, lot, better. Three ways with fabulous Dorset lamb was classic cooking with a twist which celebrated a wonderful flavourful ingredient to the max. On the first plate the delicious fat was left on the fillet, and it was served with a foyot sauce made from mixing a bearnaise with reduced jus from the bones. I’m salivating just describing this plate. This was paired with a left field Thai preparation and a standalone chop – both also very good. Last but not least a plate of my beloved foie served with macadamia and peach with a slight hint of salted caramel. It was OK, but again so deeply unexciting. A good 20 mins later than we had asked to leave, we were at last presented with the final plate. A very pretty dish of strawberry, yogurt and lemon verbena was joined in a final flourish with a couple of glasses of Manzoni Moscata – itself also being rich in summer fruit – an excellent pairing from a top notch sommelier. Sadly perhaps because the kitchen had messed up the timing and was hurrying to get our last plate out, the yogurt on the bottom was frozen, which was quite unpleasant to eat, and again… the dish in general lacked any oompf. Ciel Bleu is clearly a pretty decent restaurant, but there is something that feels wrong at the moment. It is subtle without being interestingly so, and showy without much of any follow-up. It’s also very expensive for what you get and feels very out-of-place in a time when more modern expressions of fine dining at at the fore. Amsterdam has never realistically been as formal in approach as the more decadent addresses in Europe, and this is part of its charm. The proper high-end restaurants that are getting it right now are doing so by maintaining the qualities of elegance and staff-to-cover ratios, but placing that high quality of care in more informal settings. More focus on food and less on pomp will win the day – here that balance is a little off.